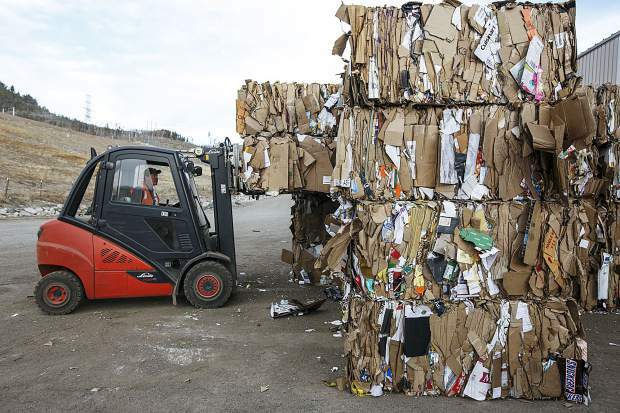 A tray machinery picks up recycled cardboard material at the Summit County Landfill Wednesday in Dillon. As ballots are mailed out this week, among the biggest local items at issue is Summit County’s ballot initiative 1A. The ballot item asks voters to approve a mill levy that would raise $8.8 million a year for a variety of county programs. The funds would provide for wildfire mitigation, mental health services, affordable early childhood care and education as well as revamping the county’s recycling program. The 4.7 mill levy would raise commercial and residential taxes for county residents annually by $33.96 for every $100,000 of property value. So for a property worth $1 million, the owner will pay $340 in additional property taxes each year for the next decade. The $8.8 million would be divided annually, with a guaranteed $1 million for wildfire prevention, $2 million for mental health services and suicide prevention, $1.7 million for recycling and waste diversion, $1.6 million for county infrastructure maintenance and improvements and $2.5 million for affordable early childhood care and learning. The Summit Daily has covered 1A in a series of stories that look into each component of 1A.